20 hours Is America's Love For Cars Fizzling? If OPEC / NOPEC were a supergroup, Saudi Arabia would have to be the band manager: the leader keeping everyone else in check. The kingdom would also double-up as the tour bus driver, given they are the ones driving the rest of the group. If Saudi is the manager, Russia must be the lead singer, stepping into the spotlight and up to the mic. Unlike roadies (the minnows of OPEC / NOPEC), everyone listens to the singer. 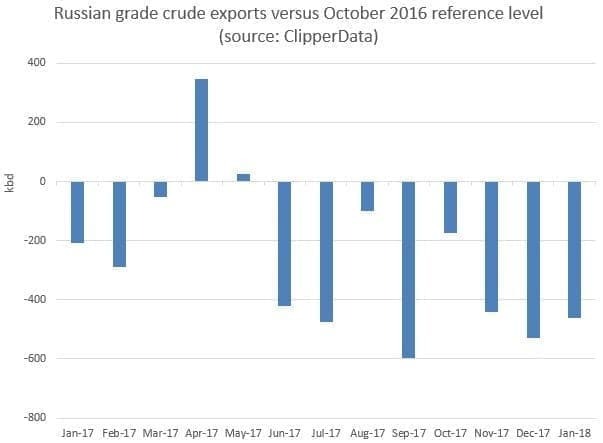 As the chart below illustrates, Russia has been remarkably successful at dialing back its exports, particularly in the second half of last year, with the likes of Rosneft, Lukoil and Gazprom being strong-armed into compliance. Russian crude exports spent 2017 averaging 240,000 bpd below October 2016's reference level, signaling compliance by our calculations. With Russia as our vocalist, Angola and Kuwait would be the rhythm section, a measured and solid basis for the band. Kuwait would be the drummer, upbeat and on point, while Angola would be the bass player, steady and reliable - as has been their compliance. We discussed last month how our ClipperData show that Angola has been in compliance by exporting 37 million fewer barrels last year versus its October 2016 reference level. As the chart below illustrates, the West African nation has continued to keep its leading destination, China, well supplied, delivering 55 percent of its 2017 exports there (servicing its oil-for-debt obligations). 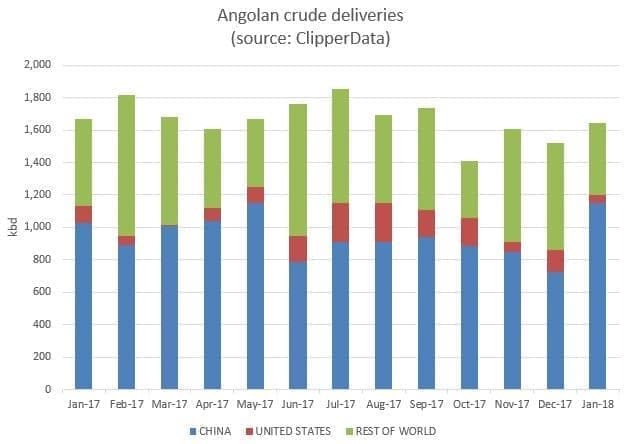 The U.S. was the second-leading destination for Angolan crude last year, but a long, long (looooong) way back in second - accounting for less than 8 percent of total deliveries. Back to our supergroup, we still need someone on the axe. Libya is perhaps the best fit for lead guitar, given the ability of its choppy exports to rise and fall like Eric Clapton shredding a fretboard. 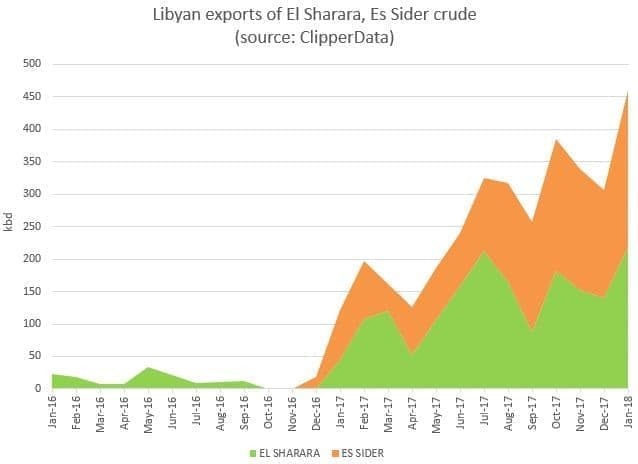 After averaging just 13,000 bpd in 2016, exports of El Sharara and Es Sider ramped up emphatically in 2017, averaging a whopping 250,000 bpd. The El Sharara field, Libya's largest, was closed in November 2014, before ramping back up again in late 2016. Flows of Es Sider were briefly taken offline in late December amid the Waha pipeline explosion, but as the chart below illustrates, exports from the Es Sider terminal rebounded soon enough as the pipeline was quickly repaired. Exports of both Es Sider and El Sharara have started 2018 by riffing higher, averaging over 450,000 bpd in January, accounting for over a half of total crude exports. As domestic production rises, total Libyan exports are now up to their highest level since mid-2013. Rock 'n Roll.